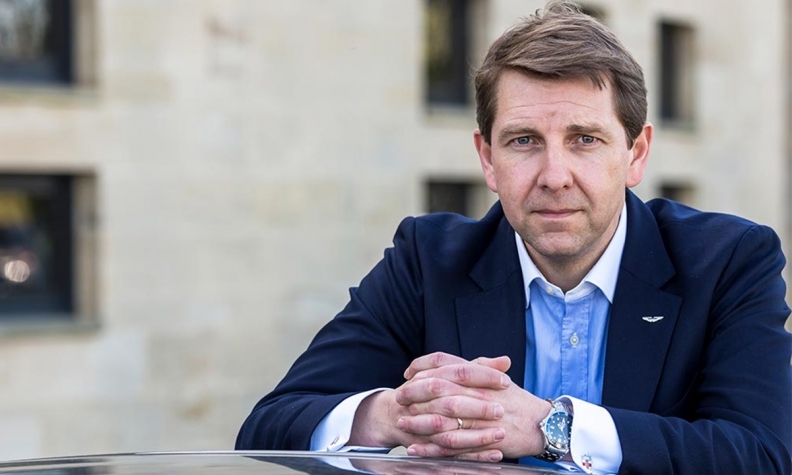 Simon Sproule, Aston Martin's global chief marketing officer, has added a new position to his resume: chief of the Americas for Aston Martin. Sproule will retain his global CMO responsibilities, following the double-duty executive roles favored by Aston CEO Andy Palmer. Six members of Aston's 12-member executive board hold additional regional leadership positions. "It's a neat way of having the executive team engaged with what's going on on the ground," Sproule told Automotive News. He will divide his time between the Aston Americas headquarters in Irvine, Calif., and the parent company's global base in Gaydon, England. As chief of the Americas, Sproule replaces Michael Kerr, who is Aston's chief human resources officer. Kerr is now chief of the Asian region for Aston in addition to his HR duties. North and South America make up Aston's largest customer base globally, largely because of the U.S. market. "This is the first time a member of the senior management team has been located in-region," Sproule said. "It signals the importance the U.S. market takes." The move -- effective Aug. 1 -- had no impact on Laura Schwab's post. She remains president of Aston's Americas region, having been plucked from Jaguar Land Rover in 2015.